Subscribe to NZ Fishing News and be in the draw to win a trip for 2 to Samoa for 5 nights! • Return international airfares ex-Auckland for two provided by Samoa Tourism Authority in partnership with Samoa Airways and includes checked baggage 1 x 23kgs, cabin baggage 1 x 7kgs, complimentary wireless inflight entertainment through your own personal device, complimentary hot meal and drinks. • Five nights’ accommodation at Taumeasina Island Resort staying in a Deluxe Ocean View Room for two adults. Includes buffet breakfast and return airport transfers per person and 1GB of free wifi per day. • One full day charter with Troppo Fishing Adventures aboard Pure Indulgence for up to four anglers. Includes snacks, bottled water, soft drinks, lunch, fishing gear and tackle. • South East Coast Tour for two people with Signature Samoa (min. of four on the trip). Includes return transfers, food and non-alcoholic drinks, a private guide and entry fees. • NZ$150 dinner for two at Paddles Restaurant excluding alcohol, provided by Samoa Tourism Authority. Offer expires 19.05.2019. Available to NZ residents only. Offer applies to 6, 12 & 24 month subscriptions only. Entry is open to all New Zealand subscribers to New Zealand Fishing News who are 18 years and over. The Prize does not include transportation to and from the trip departure point, spending money, meals, drinks (unless specified as part of the Prize), items of a personal nature, travel insurance and/or any other ancillary costs incurred in participating in, accepting and/or using the Prize. Prize must be taken by 7th December 2019. The Prize is not transferable and is not redeemable for cash. The Prize is the sole responsibility of the Winner. Fishing Charter - Fishing subject to weather and is at the sole discretion of the operator. Flights -Travel is subject to seat availability at the time of booking. Travel must be completed by 7th December 2019. Travel is not permitted during School Holidays. Once ticketed, no name changes permitted. Flight changes permitted only outside 24-hours of departure and will involve a change fee + any fare difference. Accommodation - Maximum of two adults or two adults and two children. Accommodation is subject to availability at the time of booking request. Promotion Dates The promotion runs from 1st February 2019 – 19 May 2019. No entries will be accepted outside of the Promotion Period. Prize The Prize consists of a trip for two to Samoa and associated items and products as detailed in the prize offer. Prize draw The winners will be selected by a random draw from all individuals who have subscribed to NZ Fishing News during the Promotion Period. The draw closes at 5pm on 19th May 2019 at the Hutchwilco New Zealand Boat Show 16 – 19 May. 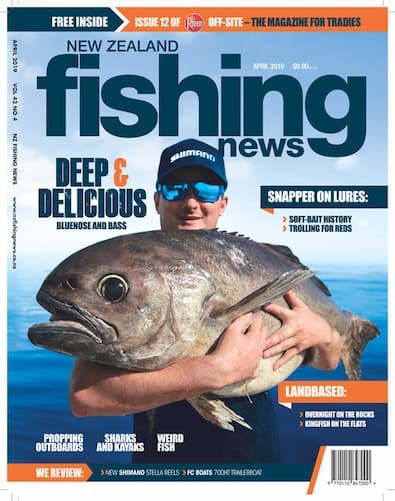 The Winner will be notified by email or mobile phone call or txt by no later than May 26th 2019 and will be asked to contact the Promoter (NZ Fishing Media Limited) to arrange the Prize. The results will be published in a subsequent magazine. The winner must agree to publicity surrounding their prize and subsequent trip. If the Winner is unable to be notified (including where emails are returned undeliverable or where the Winner fails to respond to notification) within 5 working days of being notified, or cannot be verified, or refuses to sign any legal documentation as reasonably required by the Promoter, or cannot participate in the Prize, or is otherwise unable to accept his/her status as a Winner, his/her selection as a Winner may be forfeited and an alternative prize winner may be selected, in the Promoter’s sole discretion. No financial or other consideration will be awarded to the forfeiter. General terms In the event that any Prize (or any part of the Prize) becomes unavailable for reasons beyond the Promoter's control, the Promoter may substitute the Prize (or part of the Prize) with alternatives and at its sole discretion. The Prize is subject to the terms and conditions of third party providers, and except for any liability that cannot be excluded by law, the Promoter (including its officers, employees and agents) assumes no responsibility for, and excludes all liability (including negligence) for, any claims, losses (including loss of opportunity), damages, injuries, costs and/or expenses, whether direct, indirect, special or consequential, suffered, sustained or incurred as a result of, or arising in any way out of, or in any way connected with, the Promotion or the Prize offered. The Promoter reserves the right, at any time, to verify the subscribers age and place of residence and to disqualify any subscriber that is not in accordance with these terms and conditions. If for any reason any aspect of the Promotion is not capable of running as planned, the Promoter reserves the right, in its sole discretion, to cancel, terminate, modify or suspend the Promotion, or invalidate any affected entries, at any time without prior notice. All decisions of the Promoter are final and binding - no correspondence will be entered into. Great magazine and very informative on local spots, techniques and methods used. Great on product reviews and on getting information out there.